Today we are going to learn from another prophet who calls on Yahweh's Everlasting Name. 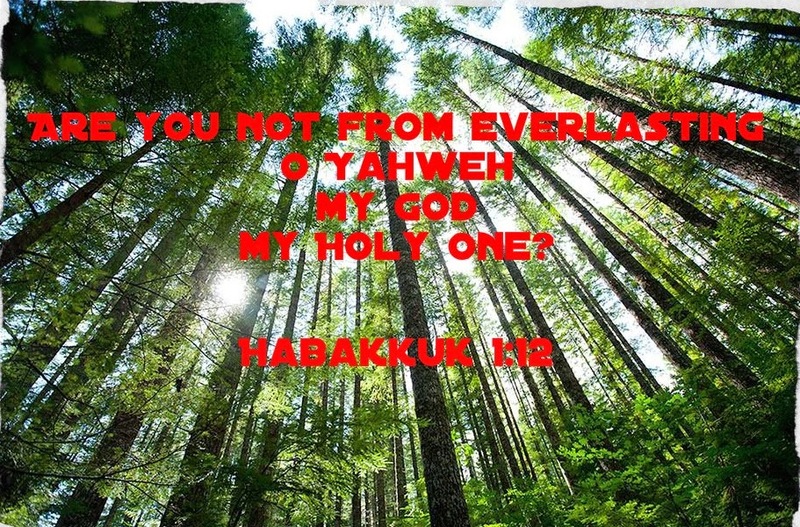 Habakkuk 1:12 " Are you not from everlasting, O Yahweh my God, my Holy One? We shall not die. O Yahweh, You have ordained them as a judgment, and You, O Rock, have established them for reproof. Habakkuk is a prophet in the Bible. There are only 3 chapters in Habakkuk and the entire book records the dialogue between Habbkuk and Yahweh God. Habbakuk wrestles with difficult issues, such as why do evil men prosper and go unpunished? In Habakkuk 1:12, he began his second complaint by asking Yahweh God, "Are you not from everlasting, O Yahweh my God, my Holy One?" Here, the prophet is not asking God for information expecting an answer. He is using a rhetorical question to affirm his conviction that Yahweh God is everlasting, indeed confirming his conviction to the everlasting nature of God. In wrestling with difficult issues understanding God and His doings, Habbakuk calls upon Yahweh God in faith. You see this right at the beginning of his prayer "O Yahweh, how long shall I cry for help and you will no hear?" (Hab 1:2) Can you feel the depth of Habakkuk's cries and his longing for God's answer? Is God indifferent? Is God inactive? God then gives Habakkuk a reply. Habakkuk trusts Yahweh God but it doesn't mean that he fully understands the answer God gives him. Aren't we also like this all the time? Habakkuk knows God hates evil and therefore does not understand why God would use a nation even more wicked than Judah to punish Judah. After all, Judah has her problems, but she is still better than the Babylonians. And then when we get to Hab 1:12, you can tell that Habakkuk has tremendous faith in God. He hangs on to the everlasting nature of Yahweh God that what He says He will do, He will bring it to pass. Israelites shall not die. Habakkuk knows that God will not totally destroy Israel because of His covenantal promises to Israel. Even though the Israelites are exiled as captives to Babylon, God will bring them back to the land. When you have time today, read Habakkuk. In 3 short chapters, you hear him calling out to God's everlasting name 'Yahweh" 10 times. Throughout the entire book, Habakkuk calls on Yahweh's Everlasting Name by faith and expectantly waits for God's answer. God replies him every time. The prophet searches and searches for a deeper understanding from God as he calls out to His Name. We need to do the same too. The prophets of old do have a very deep relationship with God. When they call out to Yahweh God, they truly have faith in the eternal God who acts and responds to them. When justice seems to be tarrying, we have the feeling that it will never come, and so faith diminishes. Let us learn from Habakkuk. Let us also have faith in our everlasting God who acted in history and continue to act now and forever. Thus Habakkuk says in 2:4, "the righteous will live by faith." Let us go forth in faith.